How much Memory (RAM) for After Effects? If you are planning on actively working heavily with this Computer I recommend a maximum single Core-Clock CPU such as the i7 8700K or the Intel i9 9900K. This i7 8700K CPU clocks at 3,7 GHz base and has 4,7 GHz single-core turbo-clock and the i9 9900K even boosts up to 5GHz with 8 Cores, 16 Threads total. The interface and frame updates in After Effects heavily benefit from high core clocks. Take a look at these tests from Pugetsystems, where it becomes clear very quickly how superior high-clocking CPUs are in After Effects CC. This is true for lots of other Creative Tasks such as 3D Modeling and Animation or Video Editing too, having a high Core-Clocks will make your Computer much more responsive and snappy. Now if you are using this Computer mainly to render out projects that you have already set-up on a different workstation, you would want to go “max CPU-core count” x “CPU-core clock” or in other words max CPU-Multi-Core Performance (similar as for 3D Rendering). This means the more cores you have and the higher those cores are clocked, the better. Unfortunately, there are no CPUs with more than 8 cores that have Turbo-Boost frequencies as high as an i9 9900K, meaning you will have to trade clock speeds for core-count. These don’t clock quite as high as an Intel i9 9900K Processor but are a lot faster in Multi-Processing demanding tasks. After Effects used to make great use of all of your Cores, but since a few versions the renderer has been re-written, unfortunately for the worse. This means, to entirely utilize all of your cores you will have to use a Render-Manager such as Thinkbox Deadline, which can launch multiple render-instances and saturate your Cores much better. The best Multi-Core Value is offered by AMD with its Ryzen 7 CPUs such as the 2700X and especially the Threadripper CPUs as listed above. I recommend going with at least 16-32 GB DDR4 RAM for 4-core CPUs and to go up to 64+ GB of RAM for 16+ cores. The most important features here are the CUDA Cores since After Effects can make use of these in 3D viewport rendering, as well as in speeding up some effects-calculations that might be applied to your footage. Great choices here are the Nvidia 2070 RTX and 2080 RTX since these have a great price/performance ratio. If you have some cash left over, consider the Nvidia RTX 2080 TI for that extra bit of performance. After Effects doesn’t natively make use of Multiple GPUs, but for tasks such as GPU rendering in Render-Engines such as Octane or Redshift, having Multiple GPUs offer a great performance increase. The new M.2 SSD Drives such as the Samsung 970 EVO or PRO have excellent performance and outperform any SATA SSD by far. Highly recommended for Footage, Cache and Software Drives. 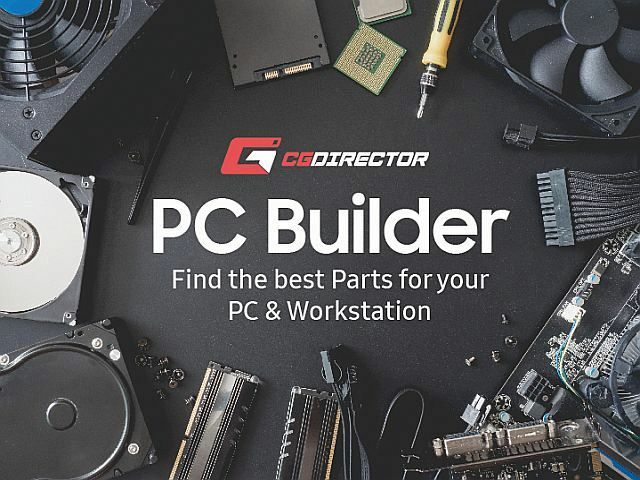 Head on over to the Web-Based CG-Director PC-Builder Tool, that will let you configure a Motion-Design & After Effects build in less than 4 clicks. What kind of Computer for After Effects are you building? I’m a Motion Graphics designer using mainly After Effects with as bit of C4D thrown in. I’m currently moving jobs and I’ve been asked what hardware I need. I”ve been on a Mac for like a 1000 years, but feel it is time to move over to PCs. What are your thoughts about off the shelf PCs. I’m not sure my new employer will go for a custom build. HP unfortunately has a lot of Xeon and Quadros in their arsenal but no high-clocking i9 CPUs or RTX GPUs. So you would have to use a sub-optimal pc if you got one from HP. I understand that your company wants a PC from a big vendor though. Maybe Dell Alienware would be ok for them? They offer PCs with i9 9900K and RTX 2080Ti. Or maybe pugetsystems would be professional enough for them? If you can swing it I’d go with an nvme m.2 SSD for both project files and cache. These kind of SSDs are much faster than ordinary Sata SSDs and have come down in price a good bit. You can get a smaller one, maybe 250-500GB and only have your current project files on those. Get a HDD (maybe 2-4TB) to archive your projects that you are not actively working on. That way you have a backup / archive and a fast storage device for active work. Samsung 970 EVO or EVO PLUS are currently one of the leading NVME SSDs that are also reasonably priced. Thanks for your time working on those useful articles. I am working essentially with Premiere and After effect. I understand your explanation with the high clock vs number of core and the efficiency of RTx 2080. I9-9900K with RTX 2080 TI etc or do you think the opportunity I saw worth it ? Thanks a lot for your job and for your answer. Seems like a good deal! Depends a bit on what kind of Brands the components are from, but if this is brand new and already assembled, I’d go for it! For Premiere the 7980XE performs excellent. Thanks a lot for your answer. To be more precise, it’s a pre-assemble Alienware Area 51 R5 (I remembered the component, not the name of the PC haha). I had a bit of time to go deeper through your website. It’s really full of useful ressources I really hope you will continue this way. Apart the pricey aspect, do you think today a i9-9900K with RTX2080ti / chip z370 / 32gbram performs better than the Alienware for editing and motion design work ? I know the 7980 is 1year and half now but still quite powerful, despite a lower clock speed compared to recent ones. Again thank you for your useful feedbacks. I will share your work with some friends, it really worth it. It depends a bit on what type of footage you will use mostly and how effects-intensive your comps or AE work will be. Having two 1080 wont help you any, but then again you won’t see any performance difference between a single 1080 and a 2080Ti as these cards don’t get utilized well by AE or Premiere Pro. If you plan on GPU rendering, then of course having good gpu power is nice. Here a 2080Ti is slightly better than 2 1080. It also has 11GB of VRAM which comes in handy compared to 8gb in some scenes. One thing that might also speak for a self / off-the-shelf assembled pc is that you can swap around parts and upgrade the components later on. Not sure if this is possible with the alienware custom chassis. I am working mostly in Ps, Ai, Id, but planning to learn motion graphics. Isn’t too much for a beginner? Want to use it to full capacity, not just buy the best one. Excellent Build! Depends a bit on your type of projects, but with AE you will definitely be a ble to utilize it fully. Since I am just a beginner, maybe it is better to get Intel i7 CPU with 32GB of RAM? Absolutely! Go ahead with 2x 16GB of Ram Sticks that you can then upgrade to 64GB if you need it. You’ll only need 64GB with very heavy projects that you might not be doing yet if you are just starting out. A good i7 that has very similar performance to the i9 9900k is the i7 8700k. Hi Alex, thanks for the great article. I’m coming from being on the Mac for a couple decades and now pricing out a PC system. I’m trying to decide between the i9 9900k and the 9940X. I run AE, Premiere Pro, C4d (TFD and Xparticles) , Syntheyes, Mocha, PhotoScan/Metashape, Lightroom & Photoshop. I’m regularly tracking, comping, and rendering 4K (or higher) footage. I like the power that comes from the 9940x, but is the 9900K higher clock speed and lower price out-weight the higher core count? Thats a tough choice! You basically also compare two different systems with each other and not just the cpu. The i9 9900K is mainstream platform with a 64GB Ram limit and 16 pcielanes for gpus, it has 3,6ghz base and 5ghz turbo clock. The i9 9940x is HEDT platform with 128GB RAM max, 44 pcielanes with 3,3ghz base and 4,4 ghz turbo clock. I’d say the 8 cores with higher clock wins against the 14 cores with lower clock unless of course you need some specific features such as 128gb ram or want more than 2 gpus. AE and PP both love the i9 9900K, c4d too I can’t say anything about syntheyes and mocha, but the high clock speeds fare very well in most digital content creation apps. Unless of course you do multi-core rendering and the like a lot. Hi, thank you for a very good overview! I’m coming from an iMac 5k Retina and would like to know what monitor you would recommend? I’ll have to get back to you on Monitors as this is an area in which I am still extending my knowledge. You won’t find a 5K display Monitor for a reasonable price but 4K there are lots of models to choose from. Be sure to get an IPS and not TN Panel monitor as the contrast and colors are better on those. Also, I think the iMac has a glossy finish. Usually most of the professional monitors have a matte finish so you don’t have any reflections distracting you, but you will have to see what your preference is there. I can recommend the Asus PB27UQ as I have been using this Monitor for quite a while now and am very happy with it, but as I said I will have to do some more testing on different monitors to be able to really recommend great monitors in their budget ranges. Hello Alex, awesome insight and tips on the best build for after effects. My question to you is, which motherboard would you recommend for all these awesome components? If you are looking into LGA 1151 Mainboards (i9 9900K, i7 8700K etc) Id go with ASUS Prime Z390-A ATX 1151 or similar Board. Hey Alex, thanks for all the awesome insight. PC build Q for you, I’m looking to build a microATX rig with 9900k and two 2080 TIs (one to start). I do mostly Ae and some C4D but want to balance that out more with 3D work. I’m a little confused on which mobo to go for, do you have a preference given this setup? Thanks! Lots of Mainboards don’t have great PCIE Slot psacing but MSI usually does it right as is the case with the MSI Z370M Gaming Pro AC. Check it out! As you probably already know the 2080Tis and the 9900K are both components that like to get hot especially in a micro atx enclosure, so be sure to get extra strong cooling. Awesome thx for the suggestion. I plan on doing a Noctua DH15 along with a somewhat spacious matx case with 4 intake and 2-3 exhaust fans. Does that raise any red flags for you? And is there a noticeable difference in 2666, 3000 and 3200 for RAM in Ae and C4D performance that I should keep in mind? Thank you! Sounds good! Ram Clock speed you can pretty much ignore as it doesnt make much difference and when it does it seems to be in the margin of error. I am looking to build a PC with its general aim to produce and mix music (for a hobby as to start off). Ocassionally I would like to play a game or two but I don’t need ultra graphic settings there. What would you recommend considering I would like to use Cubase and work with vst instruments in combination with effects I use. I want to keep latency as low as possible as I may load and record different instruments and effects simultaneously. I don’t have that much expertise in building Digital Audio Workstations but I would think loading lots of samples that tend to be quite big would require fast ssds such as an m2. samsung 970 evo. I would expect DAWs to work similarly as 3D Workstations, as in that they need a high core-clock and not as much lots of cores. This makes most sense to me considering they rely on realtime playback a lot. The i7 8700K is an excellent pick here, or if you can swing it maybe the i9 9900K. I would also expect a DAW to need some digital audio Interface such as the Behringer U-Phoria UMC22 but I’d check with a specialised Forum, such as the steinberg Forum if I were you. Thanks for the interesting reflections. I found the article you referred to very useful. At the moment I already bought a Steinberg UK22 mkII AI which suits my needs perfectly. 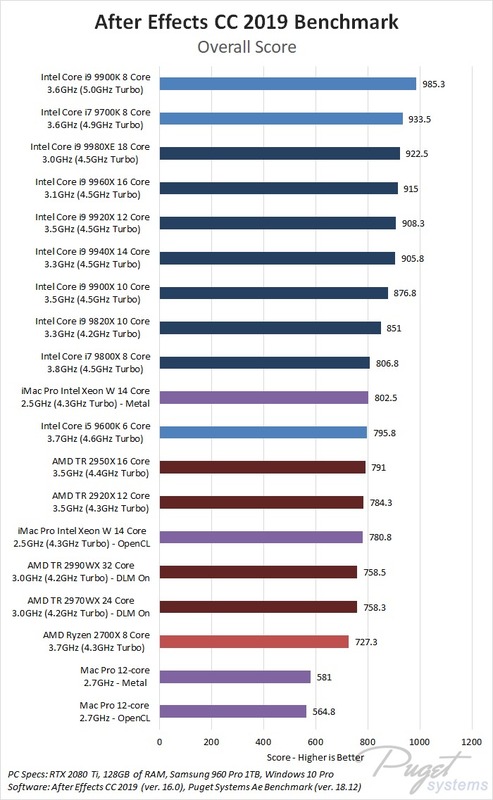 I see that the clock speed of the single core, both AMD and Intel are equal in your article but that the AMD has got 8 Cores. Do you think it will have any difference in performance? I imagine the extra cores would only kick in if I had a lot of windows opened? What are your thoughts on the added value of an M.2 SSD VS a ‘normal’ sized one? Base clocks might be the same, though even more important in single-threaded workloads is the Turbo Boost clock. Here Intel has an advantage. So it usually comes down to this: Do you need Multi-Core Performance more than Single-Core Performance? Get AMD over Intel and vice-versa. GPU PSU is irrelevant in this case. I want to know the ABSOLUTE cpu money can buy without having me to change my rams. i ONLY care about PREVIEW. not render, i want to be able to preview realtime so i dont have to render my complex scenes in order to check my result. is a high end MAC an option? maybe their OS process better stuff, and my realtime PREVIEW will be flawless. Macs are based on the same parts a computer is based on. They use the same cpus, ram, ssd parts and so on. So a mac won’t be any faster than a pc can be. That said, the only way to increase your realtime playback marginally would be to get a i9 9900k, as this clocks at 5ghz and has 2 more cores than your i7 8700k. Don’t expect a big jump though! It depends a bit on what mainbaord you have currently but dropping the i9 9900k in should normally be no problem as it has the same socket and these two generations are supposed to be compatible. you can keep the ram of course, these are excellent and will be compatible with up and coming cpus for some time. Both CPUs will perform very similarly. The 9700K has a higher clock, but has hyperthreading disabled. So 8c/8t while the 2700X with its lower clock has the possibility of using AMDs pendant to hyperthreading. As there are only very few Effects in After Effects that are GPU accelerated, both the 1060 and 1080 will perform almost the same. So if you are on a budget here, feel free to go the ryzen / 1060 route. Hi Alex, nice article. I´m working in Inventor and rendering in 3DS max – Arnold. I choosea new PC a i don´t sure, whitch Grafic card i would use. RTX 2080 Ti, or quadro P5000. THX. You might want to head over to the article about 3D Rendering, Modeling or Animation. There is lots of interesting stuff there that should get you started! My pc will be completed within a week. Can you rate it? Looks like a great Build! Go for it! 🙂 Are you delidding the CPU? That’s great! If you don’t mind, could you comment with some benchmark results of your delidded CPU? Just curious. Maybe Cinebench or similar! I’m very doubtful about what my future CPU might be. I use After Effects at the same time as Premiere Pro, on projects from many precompositions and levels on AE and videos in 4K with Sony A7s on PP. In addition I use many open Google Chrome tabs … a real workstation. Plus I’m starting to use 3D for a bit of motion graphics. I had seen the 2700X but AE is more for single cores, so 8700K. Which CPU do you recommend? If 3D Rendering is not your main Tool right now, I’d go max-core-clock. So Intel 8700K would be the way to go. There is a new generation, the 9700K and 9900K that is being recently currently, that have even better Single-Core Scores than the 8700K. Though the new generation is extremely expensive, so if you are on a budget I’d stick with the 8700K. Brand of DDR4 memory? Specifically After Effects Machine. If this is a non-ECC Workstation (basically every normal PC) I’d go with RAM from Corsair, G.Skill or Crucial. They tend to be excellent. For ECC RAM (HEDT with Server grade CPUs like XEON or Epyc) take a look at Samsung or Kingston. I have used both in XEON Workstations extensively. quick question. You mentioned that we need an Nvidia GPU in order to work good with AE. Do you mean only the Nvidia Manufacturer, or it is okay if it just has Nvidia chipset and the Manufacturer is not Nvidia? There are many Nvidia Partners that sell GPUs from Nvidia. Like Asus, Msi, Gigabyte and so on. They all use the exact same Hardware that they get from NVIDIA. They usually just design some of the Cooling solution to make it look different and depending on how good their cooling solution is can adjust the clock speeds somewhat. So any of those GPUs will be great. You can of course buy directly from Nvidia, but that is usually more expensive. Thank you very much for the fast reply, I really appreciate it. je commence une société d’animation et de cration de short or long motion 3d films pour tous usages sauf gaming .Il y a une multitude de très bons softwares ,cependant je ne peux pas acheter une machine spécialisée et considérée la meilleure par métier ou par software ,je recherche donc le meilleur desktop pour création ,rendering-animation 3d du début à la fin c’est à dire de la création à la finition commerciale avec sons et soind effects .Je me suis fixé un budget de 6 k euros (il faut mettre une limite quelque part)Peux-tu m’innonder de conseils et de choix judicieux ? I Am Mushfique. and gonna take my carrier as a 3D MGX/VFX Compositor/Post editor (film). and I this is a nice place to discuss our experiences and advice. ………………..like it !!!!!!!!!!!!! Is this configuration great ??? For After Effects you will want to go with an Nvidia GPU, as these perform somewhat better than AMDs GPUS at the moment. Also, go with a non-workstation GPU, as those are heavily overpriced. Take a look at the GTX 1060 or GTX 1050Ti as these are in a similar price-range but will perform better. What about the Ryzen 7 2700x for After Effect? Hi Alex, I Just modeling 3D, ( Solidworks )and rendering ( Keyshot ), I want to start learn with animation videos for my work. Seem there is a lot of good options of programs to learn. But what you considering a best option for learn in the market of the consumer products? An easy 3D-Software to pick up is Cinema 4D. It has a flat learning curve and there are loads of free recources available. If you are looking for something free take a look at Blender, as this is open-source, though it is usually a bit more difficult to learn as lots of the interface isn’t what you usually expect. After Effects is a must in the Motion Graphics industry. You can do compositing, Motion Design and also Edit Videos, so this is a great package to learn. There seem to be a lot of options, thats why I feel confused about what to do. I go for Cinema 4D step by step. IS this build good for after effects and premiere pro? Just in case, any major update on this build since last March? For pure After Effects / Premiere uses, would you see any significant advantage to get 2 SSD drives (one for the system and softwares and the other one for the sources and caches) rather than just one? If so, would you consider a Samsung 960 Pro 512Mb (Nvme) (for the system) + a Samsung 850 Evo 1tb (SATA) (for the sources and cache) a good option? Or would it be here worthwhile to add when possible the extra bucks necessary to replace the Samsung 850 Evo 1tb (SATA) by a Samsung 960 Pro 1Tb (Nvme), just to be sure no bottlenecking ever happens when actively working on these Adobe softwares? A Samsung 960 Pro is overkill as a system drive. So swap your initial proposed config around, but I recommend the Samsung Evo *PRO* as a system drive because the Pros have better write endurance. If you want the best bang for your buck, check out the Intel 600p NVMe 512gb as a system drive. In terms of performance, it’s in between a SATA SSD and a Samsung NVMe SSD. AE CC2017 Still use 1core for rendering right? Unfortunately AE CC 2017 still has problems with multicore rendering. The last good multi-core Version was v12. So I would still recommend getting high clock-cpu over max core count.